Mahindra will soon launch a facelifted version of the TUV300 sub-4 meter compact SUV. The facelifted model of the TUV will be inspired by the Mahindra Stinger Concept, first shown at the 2018 Auto Expo. 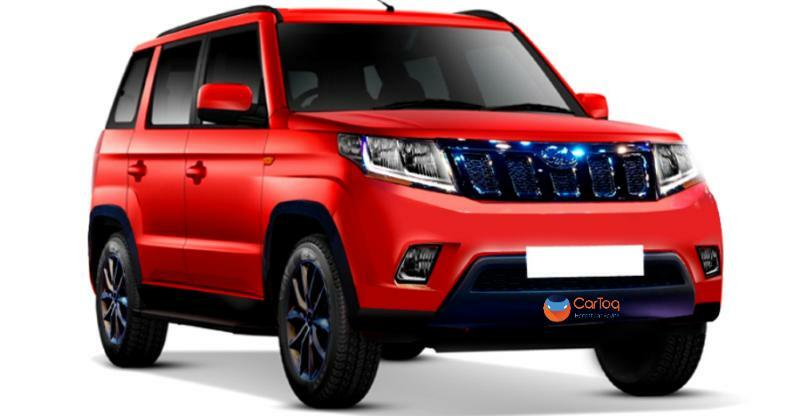 Here is our speculative render that shows what the facelifted TUV300 would look like. As seen in the render, the facelifted TUV300 gets the headlamp and grille design of the Stinger. The front bumper is another new item giving the TUV300 fresher looks. Even the tail lamps and rear bumper are likely to see mild changes. Apart from these changes, the profile of the facelifted vehicle is expected to look similar to the present version. The TUV300 competes with the Maruti Vitara Brezza, the Ford EcoSport and the Tata Nexon. However, it’s a lot more rugged as it uses a ladder frame chassis. It is rear wheel driven, making it unique among sub-4 meter compact SUVs sold in India, which generally use a front wheel drive layout. The TUV300 features a 1.5 liter, 3 cylinder diesel engine that has a twin scroll turbocharger. The engine is rated at 100 Bhp-240 Nm, making it more powerful than most other diesel engines offered by competition. But you must also remember that the TUV300’s diesel engine needs to pull much more weight due to the ladder frame chassis of the vehicle. On the current TUV300, Mahindra offers two gearbox options – a 5 speed manual and a 5 speed AMT. These gearboxes are expected to be carried over to the facelifted version as well. The facelifted version is also expected to gain features on the inside, especially in the infotainment section. We expect the facelifted model to feature a touchscreen infotainment unit with Smartphone connectivity options such as Android Auto and Apple CarPlay. The facelifted TUV300 is expected to be launched in India by the end of this year, with prices starting well below Rs. 7.5 lakhs.